We are sowing the seeds for another great year! Anyone who has an interest in gardening is welcome to attend. Guests are always welcome! RSVP by email to Bath Gamma Garden Club for more information and meeting locations. Please scroll down to see the complete schedule! Updates are made regularly. Also, the seminar flyer is below to download and share. There is no speaker for this meeting. We will announce each month's speakers and review meeting hosting duties. We will also discuss the plans and help needed for the May Seminar and Raffle, Fall Into Nature and the Hale Farm Herb Garden as well as committee assignments and other volunteer opportunities. Annual dues of $20 are due at this time. April 3, 2019 Gathering — 7:00 p.m.
Arborist and urban forester Chad Clink of Bartlett Tree Service ​will present information on maintaining and protecting our small forests from deer damage and more. Chad has a passion for trees and providing high-quality care toward their preservation. He is a registered consulting arborist with the American Society of Consulting Arborists and a municipal specialist and tree risk assessment qualified with the International Society of Arboriculture and a Licensed Commercial Applicator with the Ohio Department of Agriculture. ​Chad has worked as an arborist and urban & community forester for seven years and as a speaker for the Ohio Chapter of the International Society of Arboriculture. You love seeing butterflies, honeybees and hummingbirds, but how do you attract them and keep them coming back to your garden all summer? Cynthia Druckenbrod, American Public Gardens board member who also has served as V.P. of Horticulture for the Cleveland Botanical Garden, will teach us about the best perennials and even a few annuals that will keep your yard abuzz! We will also talk about which of these plants are the most deer resistant and how best to ensure that they keep blooming all season long. Annual​ Raffle: Tickets 6/$5.00 or 12/$10.00 (pre-order your tickets now!) ​Great baskets and prizes include items such as a beautiful Adirondack chair, bird houses, gardening supplies, gift cards, wines and more! All proceeds benefit Bath community service and plantings. The event is FREE and open to the public, but reservations are suggested for best seating. Email: Bath Gamma Garden Club to RSVP to this fantastic event! Click here for the 2019 Seminar Flyer! 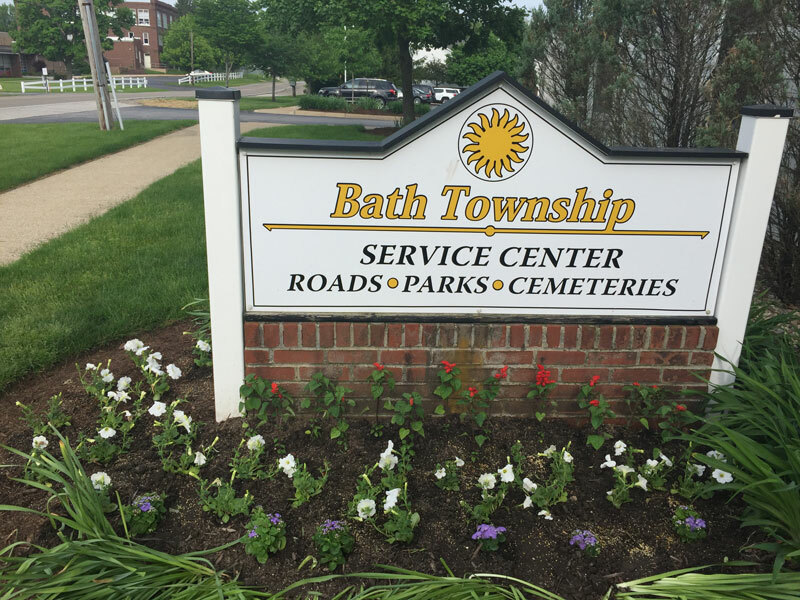 Teams of Bath gardeners install plants at the Bath Township Administration and Service Buildings, the local cemeteries, and the Post Office. Dates and times will be decided by each group. Group leaders will form teams and provide further direction. Personal gardening equipment is needed as well as gallons of water. Please contact your committee chair for details and updates! Contact Pam Reitz for more information. June 5, 2019 Gathering — 7:00 p.m.
Sandy Barbic, Summit County Soil and Water Education Specialist, presents rain garden plants, runoff reduction and keeping stormwater in place. July 10, 2019 Gathering — 6:30 p.m. The first stop on our tour of gardens is the home of Elise Bennett. We next head to Heather Pasket's garden and conclude the tour at Sally Schneider's gardens. August 1, 2019 Gathering — 7:00 p.m.
Jacqueline Kowalski, OSU Extension and Education Coordinator for Summit County Master Gardeners, will present The Modern Cutting Garden. ​September 5, Members and Friends Annual Picnic — 6:30 p.m. Enjoy a picnic with fellow club members and guests. The club will provide the main course and all members bring an appetizer, salad, side dish or dessert to share. October 2, 2019 Gathering — 7:00 p.m.
TBD - More info coming soon! November 6, 2019 Gathering — 7:00 p.m.
Deb Geiser, owner of Quince Bakery and Cafe in Kidron, Ohio, has been in the culinary field for 24 years. She is also a partner in Pioneer Farm in Apple Creek, encouraging sustainable agriculture and offering seminars and fresh produce. Deb will teach us how to make two holiday tapas as well as a dessert using some of her local ingredients. This program is being offered for $15 per person. December 4, 2019 Holiday Gathering — 6:30 p.m.
Bring a gift to exchange for the party. Handmade gifts preferred; please keep to $20. Refreshments: Bring an appetizer, salad, side dish or dessert to share. Stay tuned for more fun-filled gardeners' field trips with your friends! Friends and spouses are welcome on field trips. Be sure to let trip leaders know your plans, since they often make arrangements for group entrance tickets and reservations for lunch. Founded in 1957 as the garden club for women who work professionally, we still schedule monthly meetings (gatherings) in the evenings to accommodate the busy lives of women! Most of the field trips we plan are scheduled on Saturdays as much as possible. Our name, Bath Gamma Garden Club, has an historical significance related to the time period. Gamma indicates the numerical order of the development (founding) of multiple garden clubs, which existed in Bath at that time. We were the third of four clubs that formed (Alpha, Beta, Gamma, Delta). Today, we are the only remaining club from that era. With the onset of environmental concerns currently in our culture, we foresee a long, "green" future ahead of us in the landscape of possibility. Our goal is preserve the legacy of community landscape for younger generations. We share our interests in the love of gardening and nature with each other at our monthly meetings and with our community through published articles and community-wide events. (Look for "Plant of the Month" in the Bath Country Journal). Our Annual Community Seminar and Raffle is well known and free to the public — always a fun evening with loads of gifts baskets and prizes. To learn more about membership, events, donations/contributions, contact Pam Reitz at 330-665-5855.